…which is actually a fungus. Fungi were included in the plant kingdom until relatively late last century, when the use of molecular genetics revealed that, not only were they quite unrelated to their stationary green neighbours, they were actually more closely related to animals. The traditional kingdoms of Plants vs Animals were divided up into five kingdoms, the fungi having a domain all their own. If you look at fungi, the points of difference with plants are obvious. Plants make their own food by harnessing the energy of the sun to make sugar, by a very elegant chemical reaction known as photosynthesis. Fungi are completely incapable of this fundamental reaction, and like animals, must obtain their nutrient requirements by devouring the products of other organisms. Obviously, fungi don’t move around like animals; at least, most of the time. There are particular species of fungi which produce zoospores at certain stages of their life cycle, which are capable of actually swimming around under their own power, but for the most part, fungi don’t get around all that much. There are a range of fungi, from short-lived single-celled fungi such as yeasts, up to large multicellular organisms that can persist for some time. The fungi can be roughly arranged in three groups: Saprotrophs, Mutualists, and Parasites. Saprotrophs feed only on dead material, usually breaking down cellulose found in plant cell walls into simpler component sugars which they use for their own metabolism. Mutualists form a relationship with another organism, most commonly plants. The fungus feeds off excess sugars produced by their host plant in exchange for providing them with other nutrients, such as nitrogen, which the fungi can break down from other organic material, and is otherwise inaccessible to plants. This is the most common type of symbiosis on the planet, occurring in association with over 95 percent of land plant species. The last category are the parasites. These fungi feed on living material, of either plants or animals. Of course, these three groups are not entirely set in stone, and many fungi use one or all of these methods at various points in their life cycle. In 2003, forest scientist Dr. Catherine Parks published the results of her investigation into a particular fungus, Armillaria ostoyae, more commonly known as honey fungus, a parasite of conifers in the forests of north east Oregon (Ferguson BA, Dreisbach TA, Parks CG, Filip GM & Schmitt CL 2003, “Coarse-scale population structure of pathogenic Armillaria species in a mixed-conifer forest in the Blue Mountains of northeast Oregon”, Canadian Journal of Forest Research, no. 33, pp. 612-623). She and her team had set out to map the extent of the pathogen in the forest, to help better plan for managing forest resources, and contain the spread of the root rotting disease. The fungus is a problem for forest managers, but it is also a natural part of the cycle of the forest. As trees die and clearings are created, new trees can grow up and replace them, a process which may be less destructive in the long term than the fire regimes used currently. 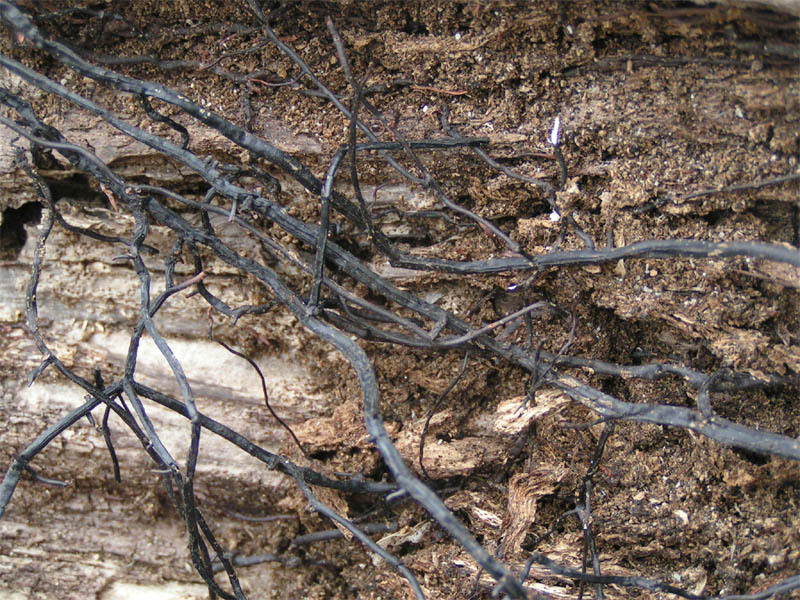 The fungus grows along tree roots as whitish hyphae, but also can send out long black rhizomorphs to move from one tree to the next more easily. Patches of dead trees affected by the fungus are easily spotted from the air, and samples of fungal hyphae were collected from the roots of various, apparently unconnected patches throughout the forest, and pairs of the samples were combined in petri dishes to observe their behavior. Many fungi have the ability to recognise other individuals of their own kind. They react differently to potential competitors, as well as to potential reproductive partners. The ability to recognise genetically different potential partners saves their energy for recombining genes with them, rather than clones of themselves, and thereby enhancing diversity in the population. The cultures Dr Parks found did not react, and behaved as one would expect them to had they been isolated from the same individual. This conclusion was further supported by sequencing the DNA of the samples. It found that they had all the exact same genetic identity, and could therefore be classified as an individual organism. Based on its present day growth rate, it is estimated the fungus is over 2000 years old, though it could be far older, up to 8500 years by some estimates. The organism started as a single spore, and grew to a size of almost 1000 hectares, or around 10 square kilometers, to a depth of about 1 metre. This dwarfs the previous record holder, a piddling 15 hectare Armillaria specimen in Michigan. 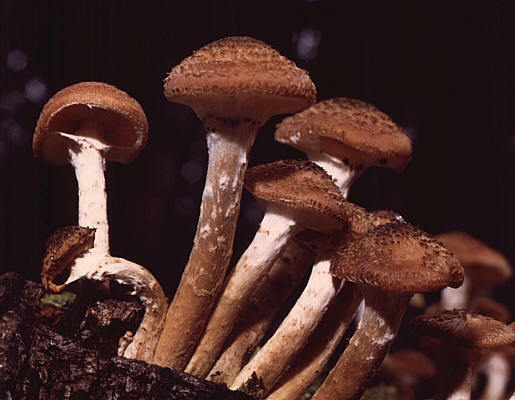 But the claim of the honey fungus to be the largest organism is disputed by some researchers, who say that unless the mycelium of all the samples is connected, it is just a group of clonal colonies, not a single individual. This is very difficult to prove, and so the claim may after all rest with a grove of Aspen trees in Utah called “Pando”, which covers only 0.43 square kilometers, but is verified as consisting of multiple stems arising from a single massive root system.